Alivia Cooper is seven-years-old and she has the personality of a star. When WXYZ Reporter Kim Russell asked her if she should interview her doctor or her parents first, Alivia wanted to do the interview. 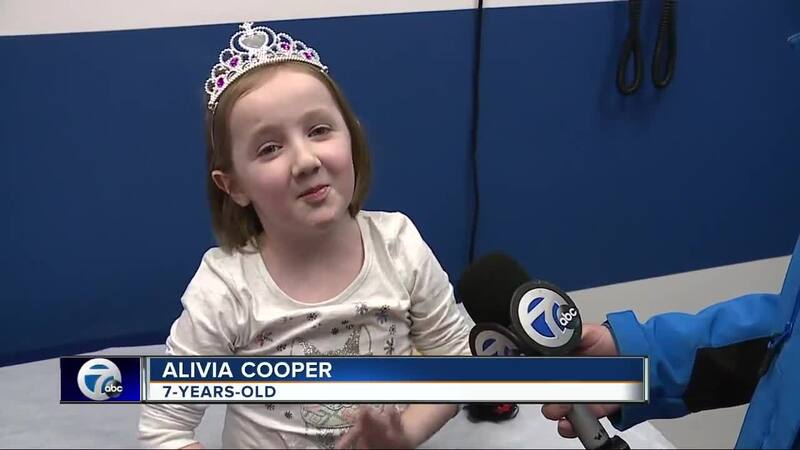 CLINTON TOWNSHIP, Mich. (WXYZ) — Alivia Cooper is seven-years-old and she has the personality of a star. When WXYZ Reporter Kim Russell asked her if she should interview her doctor or her parents first, Alivia wanted to do the interview. “How much do you work in this clinic?” she asked her doctor. “I see kids throughout the day every second Wednesday who have muscular dystrophy like you,” her doctor responded. Alivia and her family drive more than an hour from their home in Lapeer to come to the Children’s Hospital of Michigan Stilson Specialty Center for treatment. Children’s Hospital of Michigan has doctors who specialize in muscular dystrophy and Aliva has a very rare case of the degenerative disease. Duchenne muscular dystrophy is very rare in girls, affecting approximately 1 in 50 million. “I need you to know about muscular dystrophy,” said Alivia of her message to the public. We told Alivia we are doing a story to raise awareness about Muscular Dystrophy, which we hope this story does, as so many children like her need a cure. What she didn’t know is that we were also there to cover a surprise. Our cameras were rolling as staff at Children’s and the Make a Wish Foundation of Michigan threw her a party to tell her her wish is coming true. “You are going to Disney World. Is that exciting?” she was told. “It is what I have been wishing for for my whole life,” Alivia responded.